The Chinese archaeologists have found a very small \"pagoda\" - it sounds more like an ornate reliquary shaped like a pogoda -- that allegedly contains a gold coffin bearing part of the Buddha\'s skull inside a silver box. The latest census shows 63% increase in Tiger population since 2009. Of the 198 tigers, 120 are in Chitwan National Park, 50 in Bardiya National Park, 17 in Shukla Phanta Wildlife Reserve, seven in Parsa Wildlife Reserve and four in Banke National Park. The leading travel guide book publisher, Rough Guide has listed Nepal as the number one destination of the top ten travel destination of 2016. Prince Harry to visit Nepal this spring. Prince Harry\'s is taking an official tour of Nepal to observe how the country is recovering from devastating April 2015 earthquake. International Buddhist conference is held in Nepal to celebrate 2,060th Buddha Jayanti. The conference is supposed to highlight Lumbini as birthplace of Buddha and Nepal as the land of the origin of Buddhist philosophy. Recent count has recorded increased number of Indian Bison - Gaur in Chitwan National park, a natural heritage sites enlisted by UNESCO. National Geographic has listed Nepal in its top 10 destination to visit in 2016. The country needs tourism to rebuilt, it says. The leading travel guide book, Lonely planet, recently featured ‘Pun Hill’ as top ten tourist destination in Nepal. Gharial crocodile population declines in Nepal despite various programs of Chitwan based crocodile breeding center and other organizations. An Australian trekkers died near Everest base camp because of high altitude sickness. Series of scientific excavation have uncovered the Shakya palace of Tilaurakot where Lord Buddha spent 29 years as Prince Sidhartha. Bird festival celebrated in Pokhara to bring awareness about bird conservation and to promote bird tourism. Kathmandu the gateway city to the Himalayas, is listed as the top 5th destination in the world to travel in 2019 by Lonely Planet. The 4 days Bhutan tour starts with 1 hour spectacular flight along the Himalayas from Kathmandu to Paro, Bhutan. We will visit Thimphu and Paro that provides glimpse of Bhutan’s cultural life, religious practice, art and architecture. The tour is an opportunity to expand your horizons and make cross cultural connections. 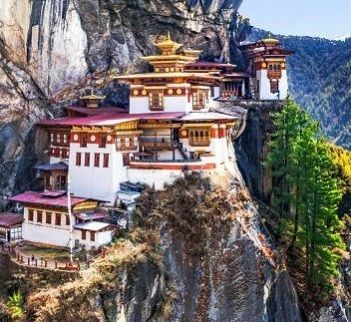 This 4 days Bhutan tour features the highlights of Bhutan and makes a perfect extension of your Nepal visit. 3 star standard hotel with 3 meals a day. Guided sightseeing with all entrance fees included. The flight from Kathmandu to Paro, Bhutan is panoramic thrill. The breath taking views of Mount Everest, Kanchenjunga (3rd highest) and other famous Himalayan peaks, including the sacred Mount Chomolhari and Jichu Drake of Bhutan awaits us. Upon arrival at Paro airport, our travel represent will receive you and we drive to Thimpu-the capital city of Bhutan. This 2 ½ hrs drive snakes along the Paro and Thimphu rivers offering gorgeous views at every turn. After lunch, visit the sights such as Memorial Chorten, National Library, Handicrafts Emporium where Bhutanese textiles and Painting School etc. Overnight in Thimphu. visit Simtokha Dzong - the oldest fortress of Bhutan, Tashichho Dzong - the main Secretariat Building, that houses king’s throne and state monastic body. Tashichho Dzong meaning ‘fortress of the glorious religion’ was built in 1641 by the political and religious unifier of Bhutan, Shabdrung Ngawang Namgyal. We will also visit the Pangri Zampa monastery. Other places of interest in Thimphu are National Library, Textile and Folk Heritage museum and King’s memorial Chorten. In the late afternoon, drive back to Paro. Visit Drugyal Dzong -a ruined fortress - 16 km away from Paro town from where you can also enjoy the views of Mount Chomolhari "Abode of the Goddess Chomo". On the way back from Drugyal Dzong, we will visit a typical Bhutanese farm house. After lunch in the hotel, we will visit the National Museum (Ta-Dzong), which originally was the Watch Tower of the Paro Rinchen Pong Dzong. Visit Paro Rinchen Pong Dzong- the administrative seat of the district of Paro and it also contains a state monastic community of about 200 monks. In option to the visits of Dzong, you can take Takstang Monastery Hike. The monastery is perched on a rocky ledge with a sheer drop of nearly 800m and overlooks the Paro Valley and river. The round trip hike takes about 4 hrs. Evening free to stroll in Paro to shop or to visit some village homes. We are transferred to airport for our flight to next destination. Join our fixed departure dates or customize your visit to ‘Nepal Tibet and Bhutan’. 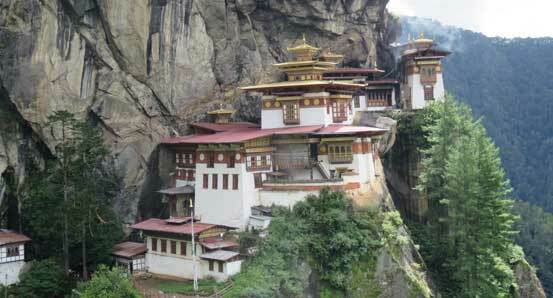 Bhutan Nepal Tibet tour could be planned in as less as 12 days. See the most sought-after places of the three Himalayan countries in one journey saving money and time. Fly to Bhutan and join the tour ending it in Lhasa of Tibet. Eco friendly & sustainable practices. Nepal was a safe haven for Buddhist practitioners for long time. Along with birth place of Buddha, there are meditation caves of Siddhas, relic stupas of Bodhisattva and Buddha. 10 days driving tour of Upper Mustang. Customize your Chitwan National park visit with special bird watching and wildlife safari. The foothills of Himalaya provide beautiful short and easy treks and day's hike starting from either Pokhara or kathmandu.